Uniquely is a concept for a mobile service that makes use of chatbot and AR technology to help customers of Construction Junction win at playing finders keepers. My teammates and I were asked to design a mobile service that makes use of two new emerging technologies for a mock client with a product-oriented business. The proposed service should help drive customer satisfaction and sales in a novel way. We started by researching Construction Junction to understand the structure of its operations as well as its history and values. We created stakeholder maps to visualize the way value flows between donors, employees, customers and more. In conducting on-site research at the warehouse, we learned about the issues that exist in the current shopping experience. We decided to create a mobile service that gives customers the ability to browse and shop for items remotely. The conversational chatbot guides the shopping experience, pulling up item recommendations that best match the customer’s needs. The inventory updates in real-time, showing people what’s available minute by minute. With the AR Home Preview feature, customers have the ability to see what an item looks like in their home. They no longer have to travel two or three hours to the warehouse and take home an item that doesn’t match the exact dimensions or look and feel of the space. To conclude the project, we presented a high fidelity prototype of the mobile service along with its uses cases and product roadmap to a group of mock investors. During this four week project, we thought of ourselves as a contract team for our mock client, Construction Junction. The business is located near campus, just twenty minutes away. People come from far away to visit the warehouse in search of reusable home appliances and construction materials at a reduced price. Generally, the customers consist of residents, corporations, contractors and institutions. Donors drop off all sorts of items, from doors to toilets and floor tiles. 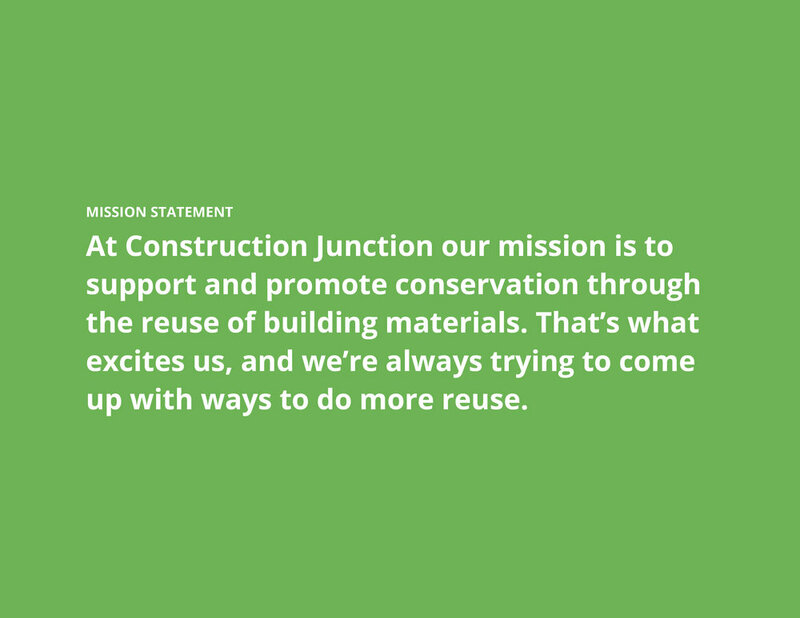 Construction Junction's mission is to support and promote conservation of resources through the reuse of building and furnishing materials. 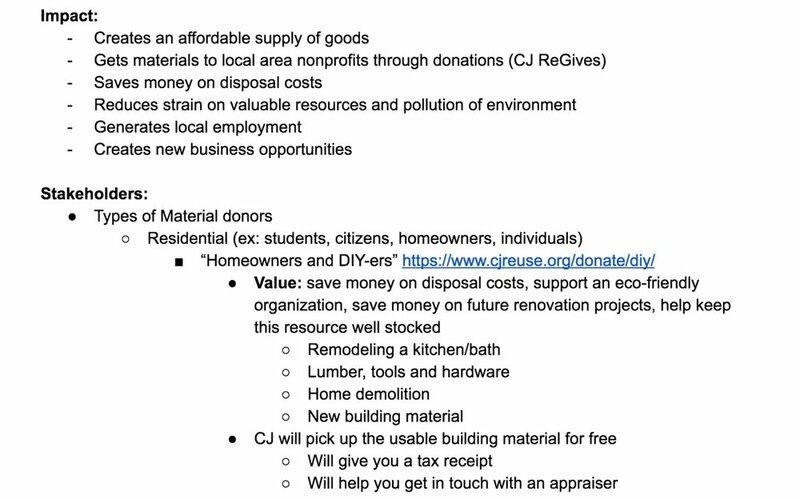 They want to provide used items with a new home. Since none of us were well-acquainted with the business operations behind Construction Junction, we did research to educate ourselves about the organization. This allowed us to identify the key stakeholders, relationships, and services, which we then represented through a stakeholder map. Doing this allowed us to and where there are pain points in the system between stakeholders. It led us to think of the ways we might introduce a new mobile service to Construction Junction’s customers. In parallel to making the stakeholder map, we compiled a document filled with information about how the business operates. We were so surprised to learn about the different programs and committees that exist to help keep Construction Junction running. There are various partnerships, for example, that help provide seasonal and temporary job opportunities to those interested in gaining work experience. For our final iteration, we made sure to account for all the individuals and businesses associated with Construction Junction. The key (top right) explains the color-coding of stakeholders. The key actors are highlighted in green. They are the central nodes that hold together others on the stakeholder map. The blue colored pills represent external organizations related to Construction Junction. Purple pills represent individuals while orange pills showcase non-living stakeholders. To identify some problems facing stakeholders today, we generated a list of assumptions about the relationship that Construction Junction has with its customers. For each prevailing assumption we had, we wrote out an opposing statement to challenge it. Then, we'd rephrase the problem and turn it into a potential service idea. For example, the first assumption we came up with is that people struggle to locate the items they want to purchase when they visit Construction Junction. The reverse assumption for this could be that people do know where to find items. How? Let's imagine that Construction Junction now offers a mobile navigational guide to lead customers towards the items they want to purchase. This exercise was useful to do as it got us thinking about the service breakdowns once again. 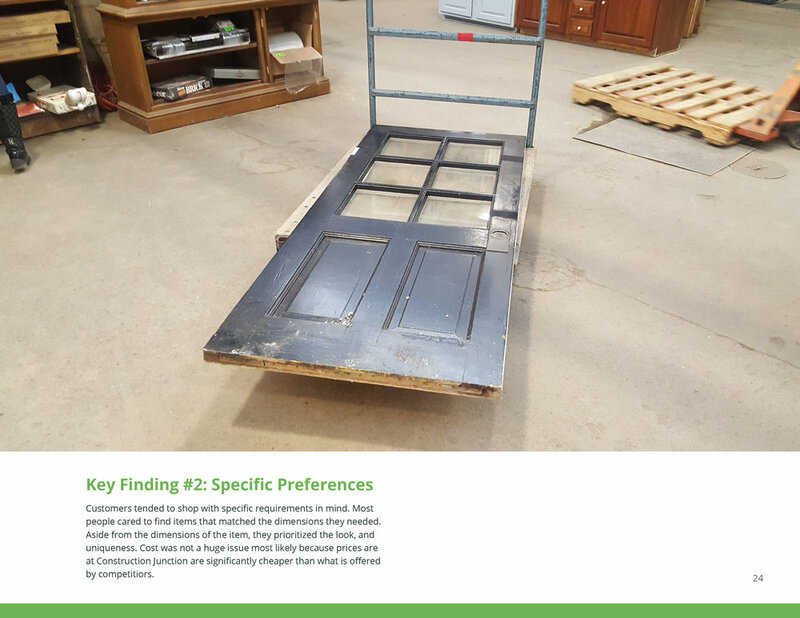 With fresh perspectives on the problem at hand, we created a series of questions to address how people have trouble finding items at Construction Junction that fit with their needs. The goal of the exercise known as, "Twenty Questions," is to generate a list of questions that poke again at service design ideas. For example, we asked: “Could Construction Junction provide an inventory expert to guide the in-store shopping experience?” What are the pros and cons to such an idea? We concluded that customers have trouble locating the items they want because the warehouse and inventory are so large. We started brainstorming how applications of emerging tech could be used to resolve some of the identified issues. We considered how we might utilize augmented reality, chatbot UIs, computer vision and predictive analytics. After running through ideas, we sketched out low fidelity wireframes to visualize our concept. The mobile chatbot service would help customers find inventory items that suit their specific budget and needs. To start out, the chatbot asks the customer to define what they are trying to accomplish in their shopping trip. What's the goal and budget? The customer can then provide inspiration photos if they have any prepared. The chatbot will then use computer vision to closely match inventory items to what's shown in the images. After the customer selects the items they want to see, the chatbot will create an optimized route for them that incorporates augmented reality overlays. The app will "project" arrows onto the floor of the warehouse to show them which way to go. We drew low fidelity wireframes to visualize our concept around a Construction Junction chatbot guide. Our peers raised many questions and concerns to us that we had not fully considered around the experience and feasibility of providing such a service. They pointed out that this service would require Construction Junction to have a very comprehensive and searchable inventory. How would that information be captured? Also, some customers might not care to take an optimized route. Browsing the aisles makes up the experience of shopping at Construction Junction. You might find items you didn't know you were looking for! Additionally, it isn't clear how the navigation feature would work. How would the app be able to track where all the items are in the warehouse? Would there be GPS tags on every item? It could get tiring for customers to have to hold their phone the whole time they are walking through the store just to see navigation directions. Lastly, we needed to reconsider how this service would add value to the business. At the end of the day, Construction Junction cares mostly about increasing their sales. How will this app help accomplish that? We decided to visit Construction Junction for a day to conduct in-person research with warehouse workers and customers. Our goal was to gather opinions on how the shopping experience could be improved, both online and at the warehouse. We conducted several impromptu interviews with shoppers. We asked questions pertaining to their shopping trip. Were they looking for items in particular? Why did they come to shop at Construction Junction of all places? Chatting with a range of customers, from families to couples and individuals, helped us pinpoint the issues we needed to address moving forward. We left the site that day with a number of key findings. Listening to customers talk about the good and bad parts of their shopping experience helped us understand where they need assistance the most and in what ways. 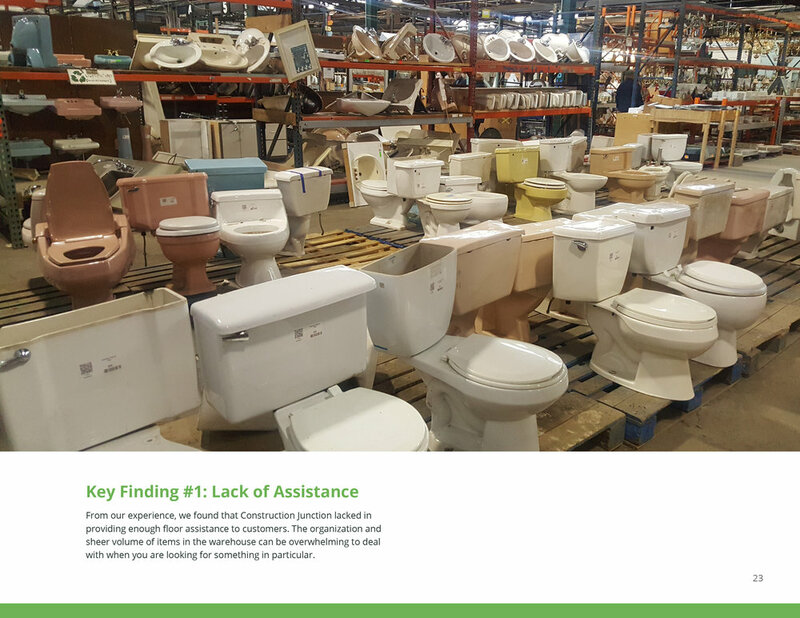 We learned that customers often feel overwhelmed searching for items on their own. Customers complained about the lack of adequate floor assistance. Customers are left to find what they need on their own which is not an easy task given the size of the inventory and warehouse space. The shopping experience tends to go much more smoothly when employees step in to lend a hand. They know the layout and inventory of the warehouse the best. When customers can't locate what they need out on the floor, the assistants will check the back stock for similarly available items. Customers greatly appreciate their expertise as so many of them shop with specific requirements in mind. In speaking to customers, we discovered that they care very little about the price of what they want to purchase. All the items are priced very cheaply as they have been used before. Customers revealed that the true appeal of shopping at Construction Junction lies in its ability to offer extremely rare and unique items that typically can't be found elsewhere at stores like Lowe's, IKEA, etc. People travel from far distances in hopes of finding something very special for their home. Problem #2: The online site offers limited details about items and fails to promote the full inventory available. Problem #3: Customers have no way of assessing how an item might look in their home. In the first iteration of high fidelity mockups, we explored a concept offering customers a way to get personalized item recommendations through a chatbot shopping assistant. The chatbot acts as a personal shopper to the customers using the service, helping them identify inventory items that suit their needs based on the information and requirements given about dimension, color, price range and so on. Customers can apply filters to refine the results. If they want to learn more about a specific item, they can check out its detail page which has the item's dimensions, description and even the SKU# which is useful to know as it allows for floor assistants to quickly check on the item's availability and location in the warehouse. Customers told us that they get stressed out trying to find items on their own. They like being helped by the floor assistants since they know so much more about the inventory. Unfortunately, the team is short-staffed so they cannot get to every shopper that needs help. Thus, the chatbot service works as a great intervention to the problem as it is a cheap system to set up and maintain. Customers can get personalized assistance on a 24/7 basis. This frees up warehouse workers to focus on more pressing tasks. It's a win-win for both parties. Customers can test how an item will look in their home with the AR Home Preview feature found in the details page. Many of the customers we interviewed said they had traveled about two hours to visit the warehouse. We looked into the design patterns of similar apps (IKEA place, Houzz, Wayfair) that adopt AR technology to enable home previews of items. We also reviewed Apple’s guidelines to design our AR screens. With the feature, users drag and resize the object to fit the frame. If users like what they see, they can add it to their shopping cart.